NEW LONDON, Conn. — U.S. Coast Guard offi­cers are pre­sent­ed with many chal­lenges and oppor­tu­ni­ties. Nor­mal oper­a­tions may quick­ly turn into a life or death mis­sion that chal­lenges their train­ing and expe­ri­ence. Coast Guard Cmdr. Diane W. Durham became the head of the Pro­fes­sion­al Mar­itime Stud­ies Depart­ment here dur­ing the sum­mer of 2010. She leads 17 mil­i­tary and civil­ian instruc­tors and staff, and over­sees the nau­ti­cal sci­ence train­ing of the more than 1,000 mem­bers of the academy’s corps of cadets. Coast Guard Cmdr. 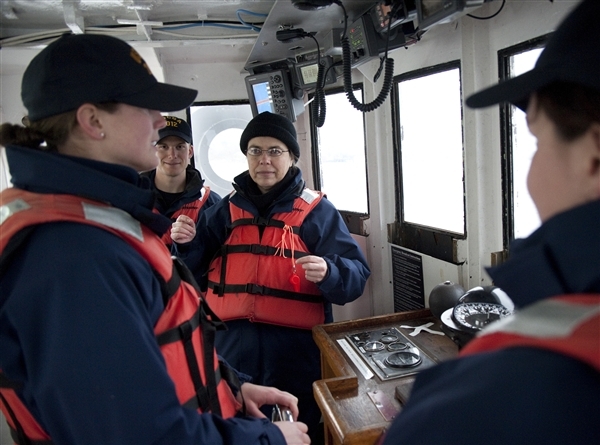 Diane W. Durham, head of the Pro­fes­sion­al Mar­itime Stud­ies Depart­ment at the Coast Guard Acad­e­my, instructs sec­ond class cadets dur­ing an exer­cise on a train­ing boat on the Thames Riv­er near New Lon­don, Conn., April 4, 2011. A few months ear­li­er Durham had put her expe­ri­ence to the test as com­man­der of the Coast Guard Cut­ter For­ward. She and her crew were pressed into action in response to a 7.0 mag­ni­tude earth­quake that struck less than 15 miles from Port-au-Prince, Haiti, Jan. 12, 2010. The For­ward was on deploy­ment, Durham recalled, and recent­ly had arrived in Guan­tanamo Bay, Cuba, when the earth­quake occurred. “The duty sec­tion and off-duty crew onboard were jolt­ed by unusu­al move­ment of the ship and quick­ly gath­ered to respond to an onboard emer­gency,” she said. “We learned that it was an earth­quake, and soon after, we learned of the dev­as­ta­tion in Port-au-Prince. Durham’s cut­ter was the first U.S. ves­sel to arrive in Haiti for the earth­quake response mis­sion. Dur­ing the response, Durham said her crew mem­bers con­duct­ed numer­ous mis­sions, includ­ing search and res­cue, air traf­fic con­trol, port assess­ments, dam­age assess­ment over­flights and med­ical evac­u­a­tions. Durham and her crew were rec­og­nized for their excep­tion­al work dur­ing the response effort. On July 4, 2010, Durham rep­re­sent­ed the Coast Guard at the White House and was com­mend­ed by Pres­i­dent Barack Oba­ma for the Haiti relief efforts. “We salute the Unit­ed States Coast Guard, includ­ing a Coast Guards­man who com­mand­ed the first U.S. ves­sel to arrive in Haiti after the earth­quake, help­ing to pave the way for one of the most com­plex human­i­tar­i­an efforts ever attempt­ed, Cmdr. Diane Durham,” Oba­ma said. At the height of the response in mid-Jan­u­ary, the Coast Guard had up to eight cut­ters in Haiti’s ports, in the Caribbean and in Flori­da waters. Air assets includ­ed a HC-144A Ocean Sen­try air­craft, five HC-130 Her­cules air­craft, three MH-65 Dol­phin heli­copters and three MH-60 Jay­hawk heli­copters oper­at­ing in Haiti with more than 800 Coast Guard mem­bers pro­vid­ing assis­tance on shore, afloat on the cut­ters and in the air. Durham said she empha­sized an open and hon­est com­mand cli­mate built on trust and com­mu­ni­ca­tion. This com­mand cli­mate direct­ly impact­ed Durham’s crew. Durham has served more than nine years at sea dur­ing her 21-year career on the Coast Guard cut­ters Rush, Deci­sive, Res­olute, Tam­pa and For­ward. Durham said she now brings her knowl­edge and expe­ri­ence from the fleet into the class­room to train and teach cadets, offi­cer can­di­dates, prospec­tive com­mand­ing offi­cers and exec­u­tive offi­cers. First Class Cadet Dana Pre­fer echoed Cousart’s sen­ti­ments. “I think that Com­man­der Durham is a wealth of knowl­edge because she has done almost every­thing you can do in the afloat com­mu­ni­ty,” Pre­fer said. “When she told us about her past jobs, I was very impressed that she held that many com­mand posi­tions and high­ly-sought-after bil­lets.